Resistance to surrounding light and interference of man-made light. Dual color OLED screen displays Sp02, pulse rate waveform and pulse bar. Press the power button to easily change the direction of display. Accurate measurement of Sp02 and pulse rate with anti-motion technology. 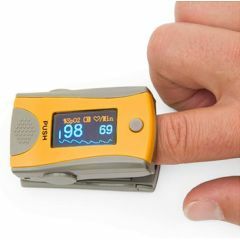 AllegroMedical.com presents The Exacta™ Finger Pulse Oximeter. Economical and accurate for home use. The Exacta Finger Pulse Oximeter provides accurate measurement of Sp02 and pulse rate with anti-motion technology. Includes two "AAA" batteries with more than 18 hours operation. Continuous working hours > 18 hrs. This is such a great product...I use on my face and neck as a moisturizer day and night and it leaves my skin feeling so soft. I've used the really expensive creams that don't do a thing, but with CaRezz I feel my skin firm. I love it! Thank you for being on top of things. I've already recommended your company to a friend who's husband needs your supplies. I've never experienced such immediate care and response from any other company. Allegro Medical is really exceptional!